Gentle giant. Teddy bear. Soft spoken. All words used to describe a 6-8 behemoth of a man who after lacing up a pair of skates and donning a sweater adorned with the number 24 was transformed into "The Boogey Man". The late Derek Boogaard's legacy will not be one of highlight-reel goals, tape-to-tape passes, or dazzling puck-handling maneuvers. But neither will it be one of punishing body checks, pugilistic dominance, or the sheer terror of his on-ice persona, all things for which he was best known publicly. What has become abundantly clear in the short time since the Minneapolis Star Tribune's Michael Russo broke the news of Boogaard's death is that he will be best remembered by those who knew him off the ice for his gentle demeanor, sense of humor, and his loyal friendships. My Twitter feed exploded in the hours just after the news broke with heart-wrenching tweets praising the Boogey Man for his character as a friend and teammate as they mourned his passing. In the interest of full disclosure, count me among those, however few we are, who did not have a problem with New York Rangers GM Glen Sather signing Boogaard to what I found to be a mind-boggling four-year, $6.5 million contract. I simply thought that the million dollars the Minnesota Wild were spending on Boogaard's 5-6 minutes of ice time could have been better allocated by Minnesota. But my opinion wasn't solely based upon his limited ice time. The list of willing partners on Boogaard's dance card had also dwindled to such a degree that his impact on the game had diminished in those few precious minutes. 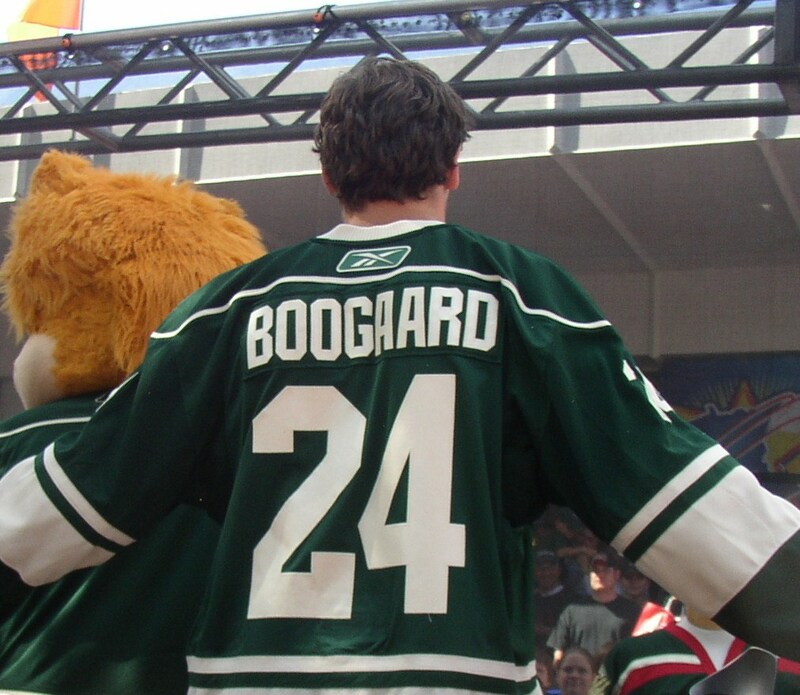 Tack on Boogaard's injury history and I was more than comfortable with the Wild letting him go. Well, as the saying goes, opinions vary and one dissenting view in particular was most memorable. Prior to the Wild's pre-season loss to the Phildelphia at Xcel Energy Center on September 25, 2010, I discussed Boogaard's departure with Flyers' tough guy Jody Shelley in the press box. After sharing my thoughts with Shelley, he insisted to me that Minnesota would miss the intangibles he brought to the Wild and his on-ice presence. After suffering through some lifeless efforts this past season, Shelley may have had a point. On the other hand, Shelley is also a member of a dying breed of old-school enforcers, as was Boogaard, who want nothing more than to maintain a place in the NHL. But Shelley, who tops Boogaard's list of most-frequent foes with six bouts between them, knew more than anyone what the Boogey Man was capable of bringing to a game. When I reminded him of their history and the potential for more with the two becoming first-time divisional rivals in 2010/2011, Shelley nodded his head, smiled, and said, "Yeah, I ain't shy of him." 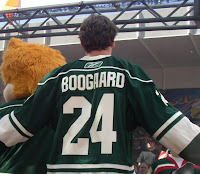 Shyness was never a problem for Boogaard either, at least not on the ice. Goodbye gentle giant, may your true legacy live on in the hearts of those who knew and loved you.